Perhaps you’ve driven past the site of the much-loved former burger place The Filling Station at Greenville Avenue and Park Lane recently and saw that the old building was undergoing renovation. 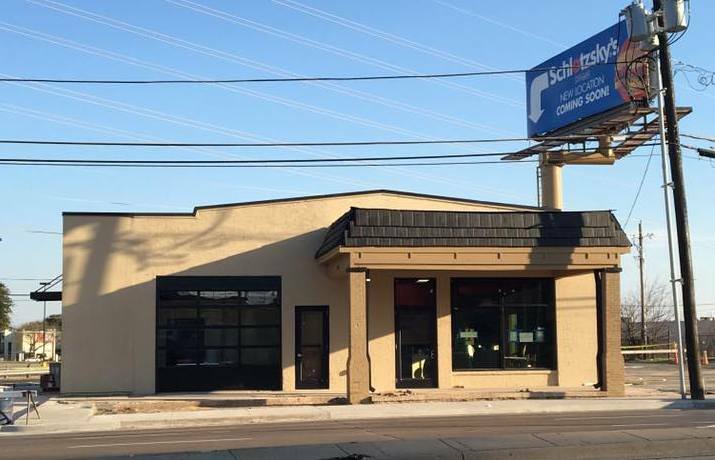 Construction has ended, and a new Schlotzsky’s (the sandwich shop founded in Austin in 1971) has opened at 6862 Greenville Avenue. And it’s pretty cool that they’ve preserved this old 1930s building, a landmark to many Dallasites. 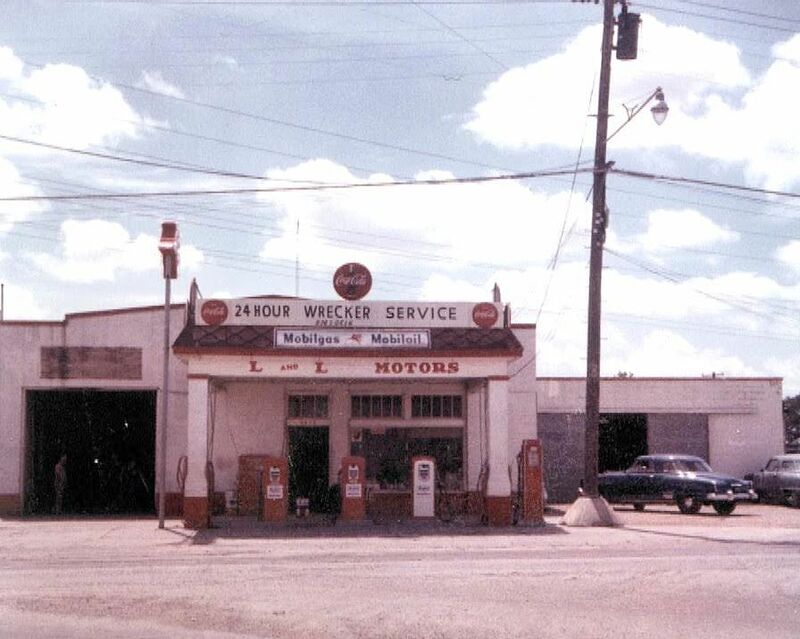 The business had begun in the early ’20s in another building across the street, but things were definitely looking up for the garage and its owners, William Homer Loveless and his son J. W. Loveless, when the new building went up. 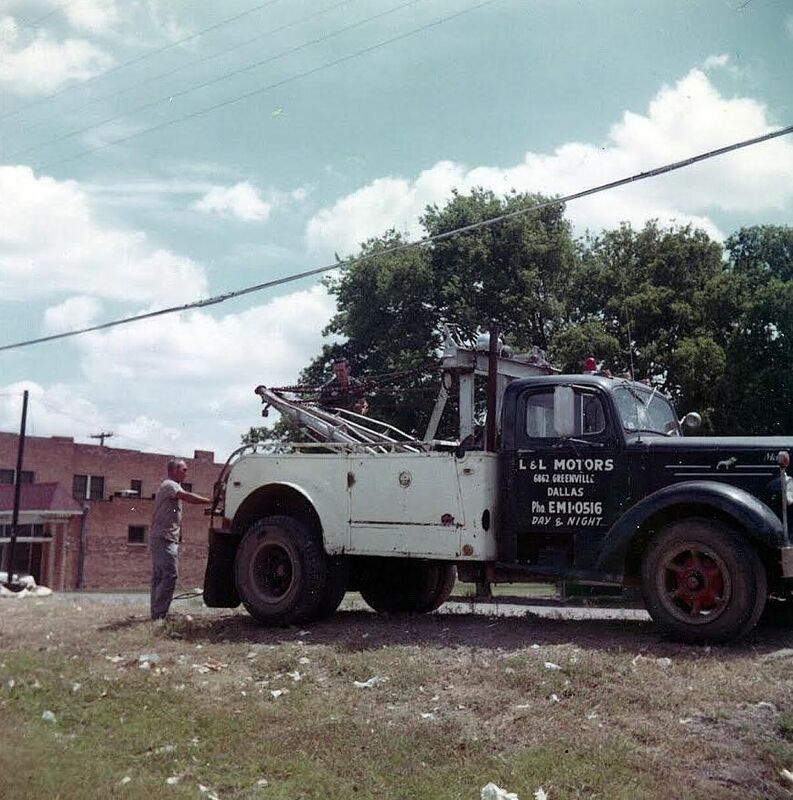 L & L Motors lasted 50 or so years until the early 1970s, when the once-sleepy Vickery area had exploded into part of “Upper Greenville,” an entertainment mecca lined with bars, restaurants, discos, and strip joints. 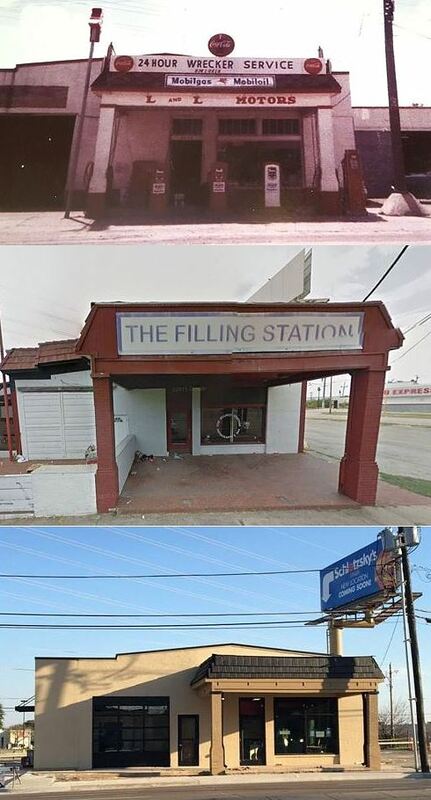 The Filling Station, a theme restaurant and bar decorated with gas station memorabilia, opened in 1975 and lasted a remarkable 29 years, closing in 2004. Filling Station super-fans still have fond memories of both the building and its menu of “theme” foods and drinks with names like “sedanwiches,” the Ethyl burger, the Tail Pipe, and the Ring Job. FUN FACT: Jack Ruby apparently ran a short-lived tavern called Hernando’s Hideaway right next door, at 6854 Greenville in the early or mid ’50s (he seems to have owned it and later sold it). It appears the building was torn down at some point. So … Bonnie and Clyde and Jack Ruby, together at last, cheek by jowl. For as long as I can remember, I’ve checked out this old building every time I drive by it, marveling that it has managed to remain standing all these years, and always afraid it won’t be there the next time I pass it. So thank you, Steve Cole, owner of this Schlotzsky’s, for bringing it back to life and appreciating it as much as a lot of the rest of us do. The photos in this post were kindly sent to me by Jeb Loveless, grandson of Homer Loveless, the original owner. Below, perhaps the oldest photo of the building, in the Bonnie and Clyde era. 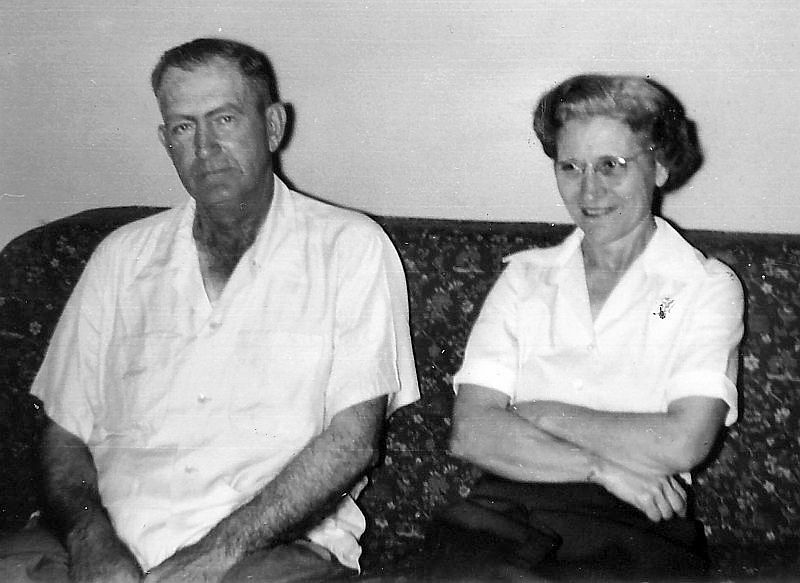 Below, Homer Loveless and his wife Jewel in 1956. Homer and Jewel’s son (and co-owner) J. W., at the pumps. J. W. with the tow truck. And here is what the old Loveless garage looks like today, as a Schlotzsky’s, decorated with the original neon sign from its days as The Filling Station restaurant as well as with several of the photos reproduced in this post. Aside from the Bonnie and Clyde connection, this little building (which has managed to stay standing for over 80 years — a feat in Dallas!) is known by most as the home of still-missed Filling Station restaurant. 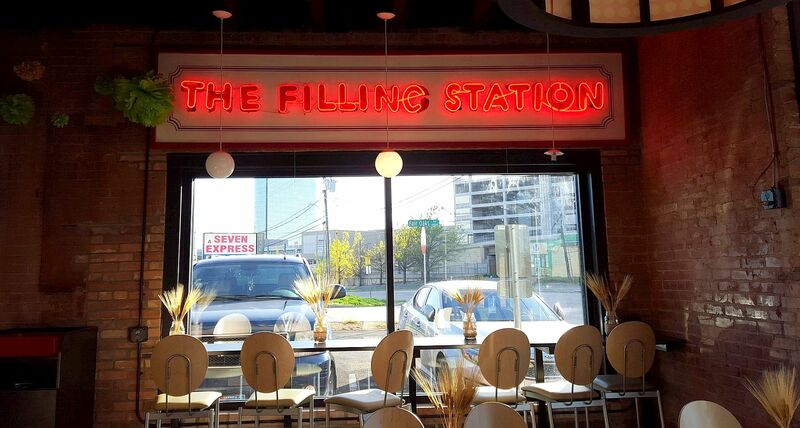 The surprising longevity of The Filling Station — 29 years in business! 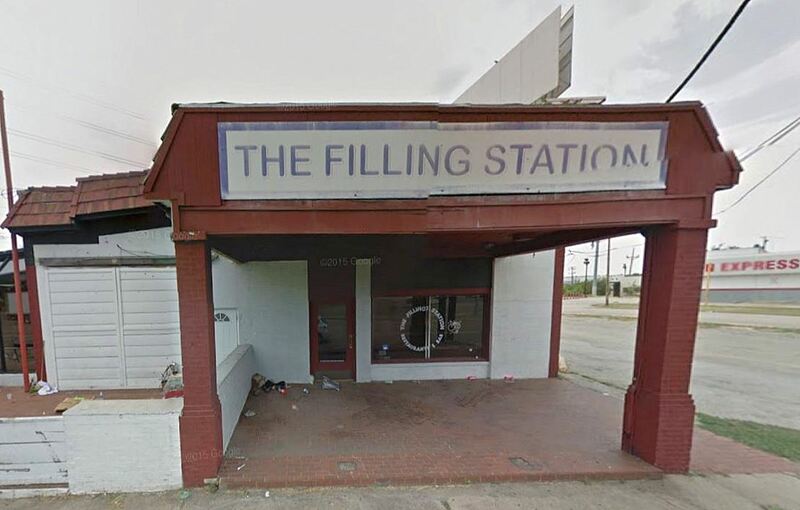 — is why the strangely unceremonious and surprisingly brief announcement of the Filling Station’s demise (which appeared in the pages of The Dallas Morning News on July 2, 2004) is so odd — its closure merited only ten words: “The Filling Station on Upper Greenville Avenue has also closed.” 29 years! That’s an eternity in the Dallas restaurant world. A few other businesses occupied the building, but none managed to stay open very long. The building was vacant for several years, and it was definitely looking bedraggled when the Schlotzsky’s people came knocking. And here it is, after renovation, preparing for its opening day as a Schlotzsky’s — the building now actually looks more like its original design, seen in the photo at the top of this post. Quotes from family members whose relatives met Bonnie and Clyde when they stopped in at the gas station are from comments on the Dallas History and Retro Dallas Facebook pages (used with permission). A Lakewood Advocate interview with the owner of this Schlotzsky’s, Steve Cole, is here. He talks about his dedication to saving as much of the structure as possible, keeping the original brick walls and the wood floors. To take a photographic tour through what remained of the old Filling Station, see the real estate listing on Zillow here (click on the first picture and a slideshow of large photos will open). 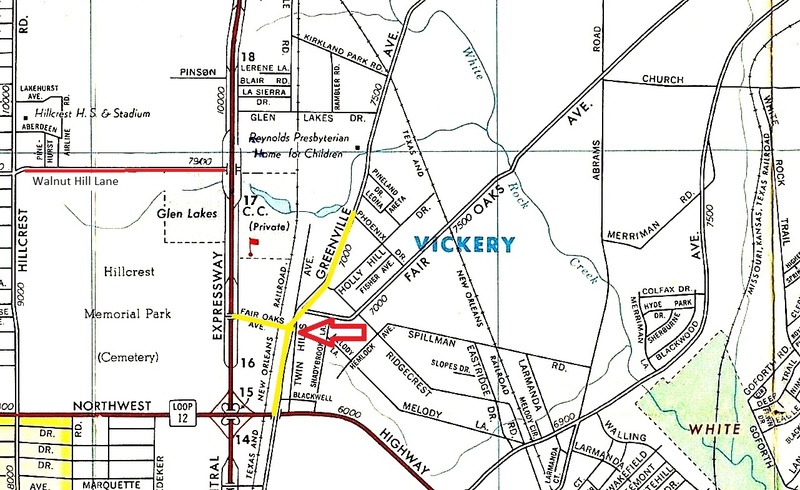 It’s hard to believe that the little town of Vickery operated essentially intact just around the corner from the new NorthPark. Then almost overnight we all flocked to the area as the nucleus of the Dallas restaurant scene. 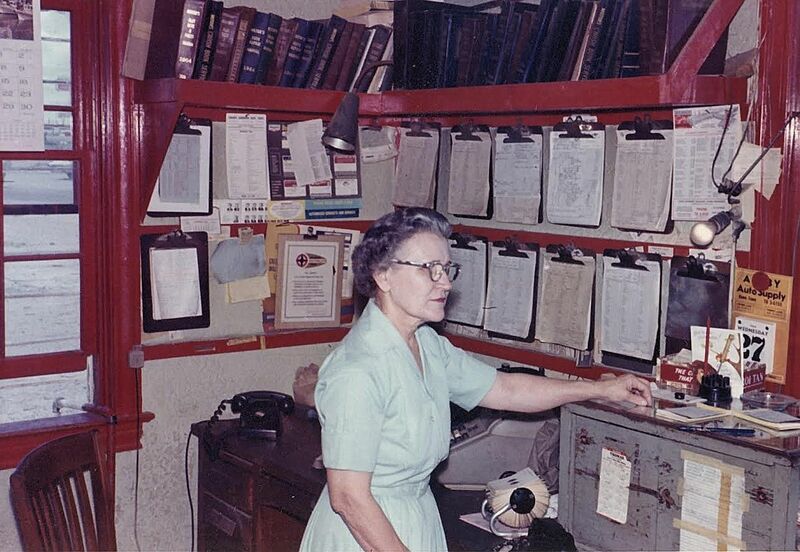 Do you remember Judge Roy Beans, Annie Santa Fe, The Vickery Feed Store, Our House, The Rail Head? And don’t forget ‘Vickery had a Whore House in it”….. someone moved the now infamous Chicken Ranch there and served fried chicken for a time. Those were the times of our lives, Thanks Paula….. Thanks, Smokey. I’ve been meaning to write about the Chicken Ranch for over a year now! 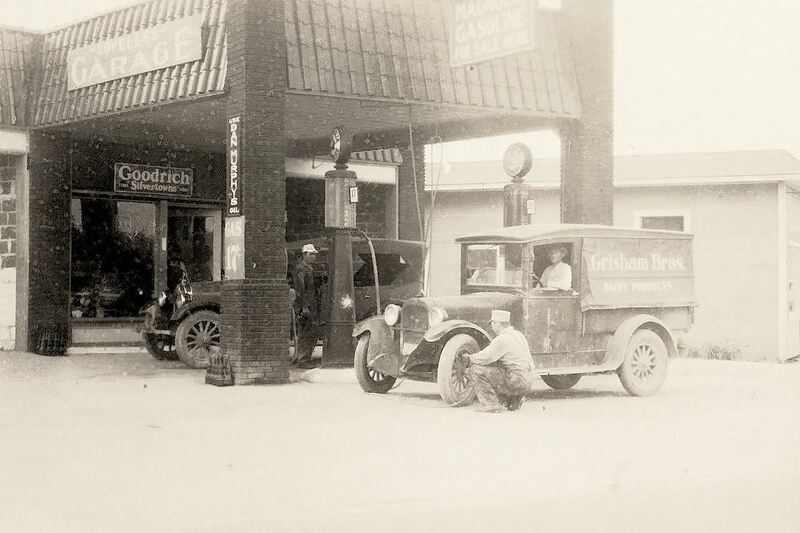 So in the photo of the two men at the gas pumps, is that Greenville Avenue in the background (with the cars driving towards the railroad crossing)? Or is it Park Lane (with Greenville in the immediate foreground (running towards the blue building)? That was exactly MY question, too! I stared at that for the longest time trying to figure it out. I’ve updated the post to show that the road heading toward the railroad crossing (toward Central) is the very, very end of Fair Oaks. See above for the update and a map from 1962. Thanks, Robert! I’ve replaced my photos with your straightened versions! Great great article……..fond memories in the 70s of this icon…..great food, great decor and the Tune Ups weren’t bad either….great memories……thanks for the detailed historical account! Thank you so much for the great story on our store! We’ve done quite a bit of research on it and always enjoy learning more of it’s history. Thanks, Judy. Y’all keep up the good work! Great story, thanks for the memories! I moved to Dallas in 1976, first night was at the Filling Station for my first nachos ever (and jalapenos!!) I returned many times over the years, including a date with my soon-to-be wife (now wife of 37 years). Second night at Annie’s Santa Fe across the street! I have the 2 original Southwest visible 1920’s gas pumps and globes that were in the restaurant in the 1970’s with the original globes that display “The Filling Station” from the 1970’s. Very cool. Very historic. Offered them to current owner but he was not interested. 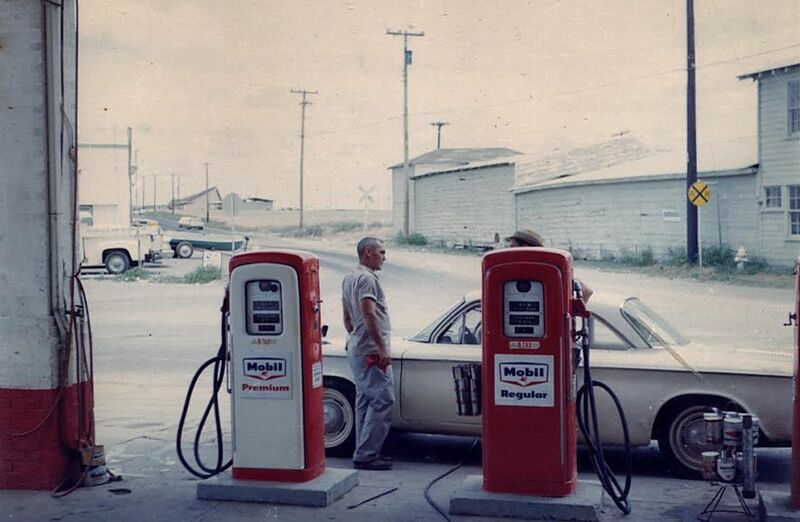 The gas pumps were built by Southwest Pump Company in Bonum, Texas, the only visible gas pump manufacturer in Texas in the 19teens and the 1920’s. Most pumps were built in the Northeast, US. The prominence is the custom made globes that displays “The Filling Starion” logo and Southwest pumps made in Texas. Wish I could figure a way to get them back on site. If interested please call.